The cable signal in the communities has been shut down and only the local TV stations are left which are normally part of the coup-makers system, which is why only the population only has access to the official information and this has created an environment of fear and terror by the communities to be able to participate in the protests, above all in the central district. And ever since in the regions there has been fear of participation due to the repression that is taking place in our country. ...the resistance movements is posing the issue in the way that the problem is not only the constitutional restitution and coming back President Zelaya, the problem is people want a new constitution. People want assembly. People want more participation, more actors in the process. When US President Barack Obama -- while on a trip to Moscow to discuss vital topics on the subject of nuclear weapons -- was declaring that the only constitutional president of Honduras was Manuel Zelaya, the ultra right-wing and the hawks in Washington were making manoeuvres for Zelaya to negotiate a humiliating pardon for the illegalities attributed to him by the perpetrators of the coup. Thousands of supporters of Honduras's ousted president held rallies on Friday, as talks in Costa Rica between his representatives and the rival de facto government ended without a breakthrough. Zelaya and Micheletti did not meet yesterday, although both were present in San Jose. Instead each met separately with Costa Rican President Arias. Then in an unexpected move, Micheletti announced he was returning immediately to Honduras, placing in doubt the future of any direct talks. He later stated vaguely that "he might return if necessary." In the rallies that were held this Friday in the Honduran capital of Tegucigalpa, a fact rarely discussed in national and international press--but well-known throughout the Honduran population--was made public: Roberto Micheletti's attempt to modify this Central American country's Constitution in 1985. Chavez said Micheletti should have been arrested in Costa Rica and that the United States should be putting more pressure on Honduras to return Zelaya to power. / Chavez also read a note from his mentor Fidel Castro, saying the Cuban leader told him: "Chavez, that meeting in Costa Rica is opening the door for a coming wave of coups in Latin America." Honduran Oligarchy: "The War is Against Chavez"
Legislator, Mauricio Reconco, of the Liberal Party, defended the legality of the overthrow of Zelaya, "we know what was done was best, if not we would have been in a worse situation," he said. Immediately he went on to attack Chavez, "in this moment we are seeing internationally that Honduras has shown it is a country that has put a block the path of Hugo Chavez. The war is no longer against ex-president Zelaya, but against Hugo Chavez." A DNIC spokesperson told TeleSUR that police detained Murillo Sanchez on a 2007 warrant when a judge declared him "in contempt" for violation the terms of his probation. Murillo Sanchez, who is still in police custody, must now go before a court to determine if he will be imprisoned. TeleSUR warns that the court takes orders from the coup government. Honduran political cartoonist Allan McDonald, who had published several cartoons in support of Zelaya, was arrested and detained by the Honduran Armed Forces, who destroyed his materials and cartoons. Arias never once mentions the role of the United States in destabilizing democracy across Latin America but he doesn't have to. Uncle Sam is the world's Numero Uno arms dealer. What Arias does say is: "This year alone, the governments of Latin America will spend nearly $50 billion on their armies. That's nearly double the amount spent five years ago, a ridiculous sum in a region where 200 million people live on fewer than $2 a day and where only Colombia is engaged in an armed conflict." According to press reports, so far the mediation of Costa Rican President Arias, encouraged by Secretary of State Clinton, has not produced any change in the refusal of the coup regime in Honduras to allow Honduras' democratically elected President Zelaya to resume his office. That's not surprising: the strategy of the de facto regime seems to be to try to run out the clock on Zelaya's term, as long as they can. Although the coup's initiators say they were motivated by other factors, what really spurred their reactionary ire was Zaleya promoting better pay and conditions for Honduran workers in general, but particularly for the virtual sweatshop slaves whose cruel exploitation by mostly U.S. garment firms has been an utterly obscene profit generator for shameless owners residing in luxury in the North. 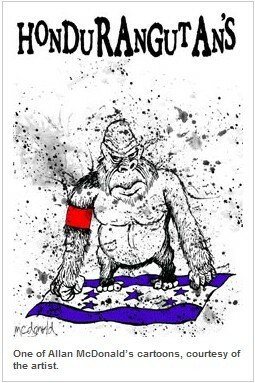 The June 28th coup d'etat in Honduras that toppled leftist president Mel Zelaya sends us back to the bad old days of the "gorillas" - generals and strongmen who overthrew each other with reckless abandon and the tacit complicity of Washington. I don't know what is weirder: that a pro-coup newspaper would think that quoting the daughter of the Chilean military general, Augusto Pinochet, somehow adds to its already bombastic portrayal of a military coup as a legal or "constitutional" action, or that Ms. Lucia Pinochet Hiriart (in the photo, above) has a constituency among the coup-defenders to the extent that she would be making public statements in praise of it, and those statements would somehow be newsworthy. Roberto Micheletti, the Honduran provisional leader, refused to meet Manuel Zelaya, the man he ousted, while Mr. Zelaya called his rival a "criminal" and a "thug." Honduran popular organizations mark Friday their 13th consecutive day of peaceful resistance to the military coup with several national rallies, leaders stated. Republican lawmakers have slammed US President Barack Obama for branding Honduras' political upheaval a "coup," saying he was aligning himself with leftist Latin American leaders.